The endospore stain is a differential stain used to visualize bacterial endospores. 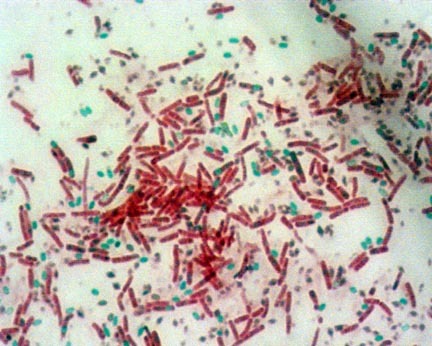 Endospores are formed by a few genera of bacteria, such as Bacillus . By forming spores, bacteria can survive in hostile conditions. Spores are resistant to heat, dessication, chemicals, and radiation. Bacteria can form endospores in approximately 6 to 8 hours after being exposed to adverse conditions. The normally-growing cell that forms the endospore is called a vegetative cell. Spores are metabolically inactive and dehydrated. They can remain viable for thousands of years. When spores are exposed to favorable conditions, they can germinate into a vegetative cell within 90 minutes. Endospores can form within different areas of the vegetative cell. They can be central, subterminal, or terminal. Central endospores are located within the middle of the vegetative cell. Terminal endospores are located at the end of the vegetative cell. Subterminal endospores are located between the middle and the end of the cell. Endospores can also be larger or smaller in diameter than the vegetative cell. Those that are larger in diameter will produce an area of "swelling" in the vegetative cell. These endospore characteristics are consistent within the spore-forming species and can be used to identify the organism. Because of their tough protein coats made of keratin, spores are highly resistant to normal staining procedures. The primary stain in the endospore stain procedure, malachite green, is driven into the cells with heat. Since malachite green is water-soluble and does not adhere well to the cell, and since the vegetative cells have been disrupted by heat, the malachite green rinses easily from the vegetative cells, allowing them to readily take up the counterstain. The staining procedure is here.